We travel the entire state of Arizona as well as Nationwide to find leaks. Precision Utility Locating specializes in locating leaks in miles of pipeline. We are dedicated to serving our clients' needs. Our goal is 100% customer satisfaction, and we strive to bring you the best quality service. Commercial properties can be challenging because many times the work must be done after business hours at night or on the weekend. We're available 24 hours a day, 7 days a week. You can schecule a locate by us designed to keep your business open without interruption. 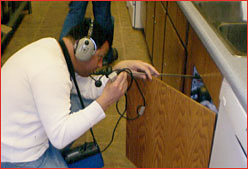 Trusted and recommended, Precision utility Locating is the premier provider of sub-slab leak detection services in Arizona. A small leak in a swimming pool can turn into a nightmare and cause your water bill to soar. 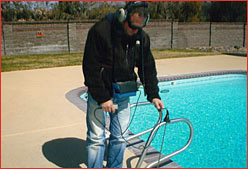 Call us to detect swimming pool leaks. You can count on Precision Utility Locating to accurately find leaks in irrigation and fire sprinkler systems, both commercial and residential.